Rapid ecological and economic transformation has put water supply and quality at the forefront of public priorities across the U.S. and around the world. Global leaders are actively trying to understand how they can provide for a secure water future in the face of growing populations, weather and climate changes, and financial barriers. Water reuse is gaining momentum as a key to immediately and effectively addressing water scarcity. But how do we implement smart water reuse programs that are both environmentally and economically sound? This workshop will bring together senior leaders from communities, industry, government, universities and NGOs work together to discuss how to implement water reuse programs that will help build a more sustainable water future. We will discuss key water challenges being faced here in the US and around the world. Experts will provide an overview of the current state of water reuse technologies, highlight future technology developments, and evaluate policy options to promote more rapid and widespread adoption of water reuse programs. 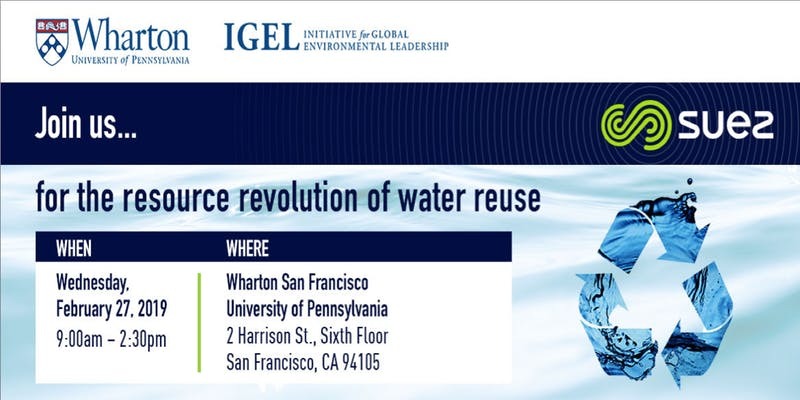 We invite you to join in the discussion and to interact with a great network of experts and leaders actively pursuing the pathway to water sustainability through water reuse. Your thoughts and input will help to drive actual recommendations for policy makers and contribute to secure water future.